When we talk about fine motor skills, we’re referring to the use of small, precise movements of the muscles in the hands, fingers, wrists, and forearms to manipulate objects and use tools and equipment. These movements enable us to carry out an endless number of daily tasks, from buttoning clothing to using utensils and playing with toys to writing with a pencil. So many activities require good fine motor skills, and it’s important that children develop these skills on the right timeline. Fine motor skills begin to develop in infancy and strengthen throughout childhood, and they’re an essential component of proper development. Children need to acquire strength and dexterity in their hands, but it takes many years for their skills to mature to an adult level. As kids grow and hone their skills, they are able to carry out a wide variety of tasks with greater ease. As with many things, some children develop fine motor skills more easily than others. Providing an environment that fosters development is important, as is offering many opportunities for practice. Encouraging fine motor skill development has some surprising benefits that reach far beyond accomplishing daily tasks with greater ease and proficiency. Good hand-eye coordination means that a child is able to complete activities requiring simultaneous use of the eyes and hands. As fine motor skills improve, so does the brain’s ability to use the fingers purposefully in coordination with information received through the eyes. This is a complex cognitive ability that’s essential to normal child development and success in school. It’s also what enables us to perform daily activities throughout our lives, from putting on shoes to driving a vehicle. Improving fine motor skills leads to greater control when using implements like pencils, crayons, paint brushes, and scissors. That results in more consistent, legible handwriting and superior art and drawing skills. As strength, flexibility, and dexterity of the hands increase, children experience fewer barriers to school work and creative pursuits. Children with well-developed fine motor skills are able to handle a greater number of daily tasks on their own. Being able to bathe or shower, wash their hands, brush their teeth, get dressed, and comb their hair independently is achieved in part through fine manipulation of the fingers, hands, wrists, and arms. The more a child’s fine motor skills improve, the more tasks he or she will be able to accomplish without assistance. An increase in independence gives children a sense of satisfaction and accomplishment. As their fine motor skills progress, their self-esteem often increases. Recognizing their own ability to handle their personal care, to write and draw with proficiency, and to complete other daily tasks leads to greater confidence and pride in their own capabilities. Fine motor skills are the underpinning of many other aspects of child development. Research has linked fine motor skill development to higher achievement in mathematics. In multiple studies, researchers have concluded that better fine motor skills in young children predicted higher success rates in mathematics over time. Even when accounting for non-verbal IQ scores, better fine motor skills consistently predict greater math ability. If you wish to see long-term improvement in your child’s competence in math, working on fine motor skills may have a positive effect. Learning to code is an ideal way for children to improve their fine motor skills while also gaining technical expertise, cognitive flexibility, and critical, real-world skills. 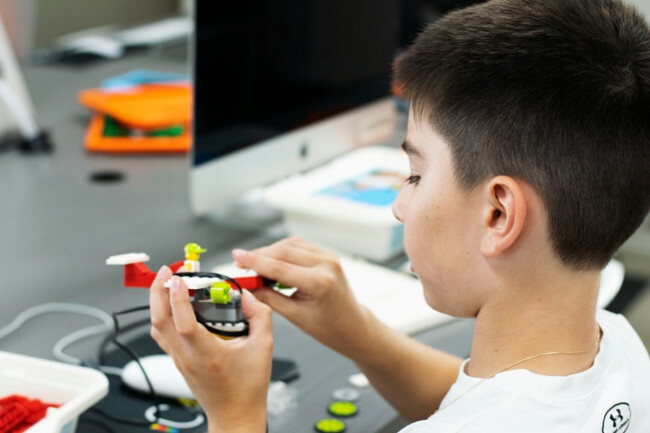 iCode’s programs for children teach foundational programming skills to enable children to build websites, apps, and software and to work with robotics. Children also learn organizational and problem-solving skills and the ability to focus on a task and notice details. Fine motor skills are a part of that learning, as children manipulate the physical components of robotics kits, electronics, and controllers. Using a computer keyboard also requires highly coordinated finger and hand movements, and studies have demonstrated that typing can lead to improvements in the fine motor skills of children. If you’re ready to get your child started on a journey to learning technical, cognitive, problem-solving, and fine-motor skills, find an iCode school near you. We’re excited to help your child become a better thinker, problem-solver, and innovator! Summer camps are a great way to work on your child’s fine motor skills. Sign up for a summer camp today!